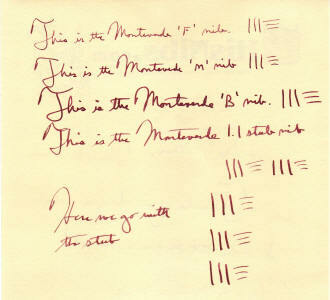 Monteverde (and sister-company Conklin) add stub nibs! 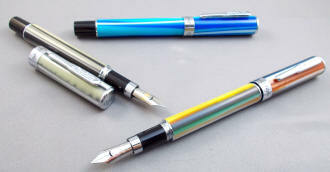 I'm very happy to announce that both Monteverde and Conklin now offer a stub nib for the majority of their pen models. Most of my personal favorite writers have stub nibs on them, and I'm excited about now being able to offer the same on some of my favorite pen designs. 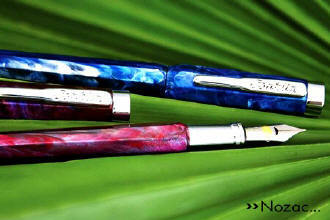 Please click here, to read more about the nibs. "I am still enjoying the Conklins and the stub nibs. They are perfect for the letters that I write to my older friends in other states. Those folks are also in my age bracket and older so the stub nib provides a decent sized image for easy reading. One elderly couple particularly dear to my heart , have friends come by to read the letters as well . These are older people who are retired or home bound and do not have the net. The letters to them are a link to a by gone age of personal contact, pleasant memories and serve to initiate memories and conversations among the readers. I was recently told that the letters were more important to them than phone calls from their relatives. They wait for the letters. The letters written with the pens that you provide. It makes me wonder how many lives you have touched and were totally unaware of it ! The pen that you provide plays an assigned part in a wondrous chain of communication extrapolation, What a sensory overload that is !!!" 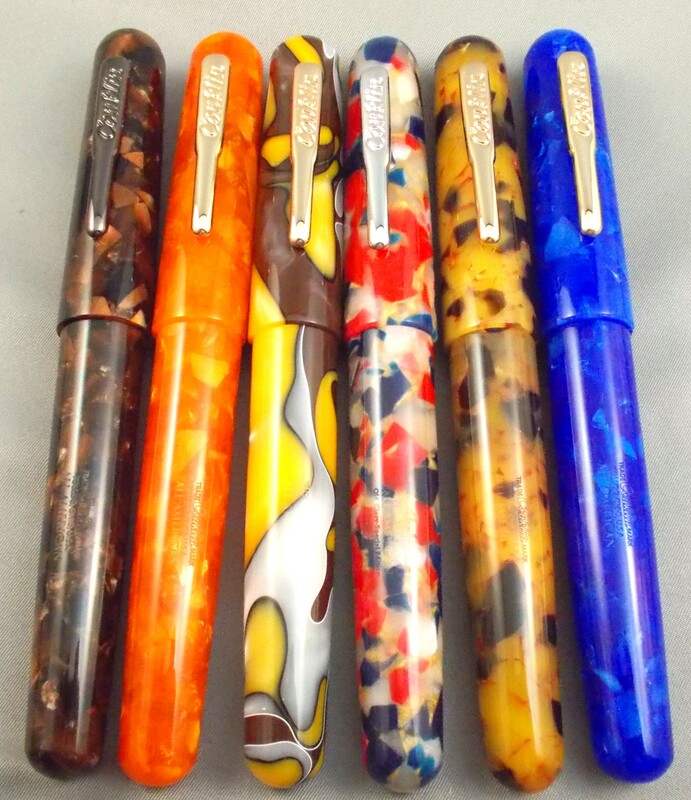 The Conklin Pen Company was established in 1898 and is regarded as one of the most significant and innovative manufacturers from the golden era of fountain pens. Having produced such models as the Crescent Filler, Endura, Nozac and Glider, Conklin Fountain Pens are valued by collectors and admired by pen enthusiasts throughout the world. 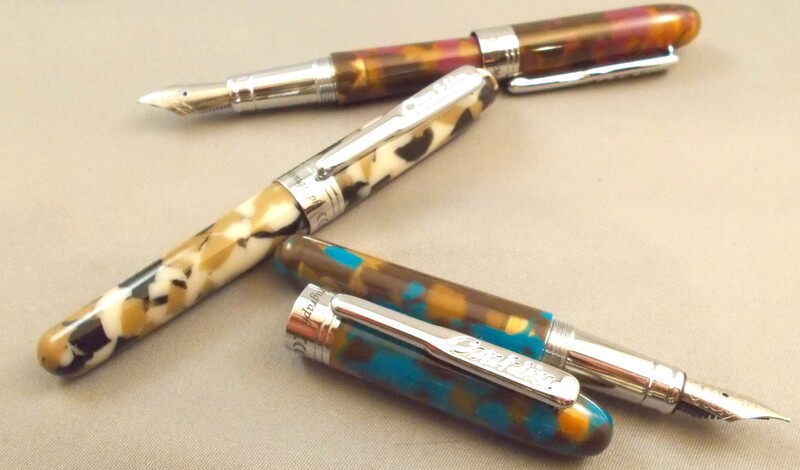 The Conklin Pen Co., continues this tradition of innovation and excellence by offering unique limited edition and regular edition writing instruments of the highest quality. Based on the original designs of early models, all Conklin Pens are manufactured by artisans dedicated to producing writing instruments worthy of their legendary name. Conklin writing instruments are guaranteed against mechanical failure due to faulty materials or workmanship throughout the life of the original owner. Conklin will repair or replace, at our option, any product that is found to be defective in materials or workmanship when it is properly returned to the Conklin repair department. Any product that is no longer in production, and cannot be repaired, will be replaced with a comparable Conklin product of our choice. This warranty does not apply to products (including nibs) which have been lost, altered, broken or damaged by misuse, accident, failure to follow instructions, or improper service or repair by any other than the Conklin repair department. This warranty does not cover normal wear including scratches, used fountain pen nibs, and refills of any kind. For this warranty to apply, purchase must have been made from an authorized dealer and you must have the proof of purchase and/or properly registered your product with Conklin. Only authentic Conklin products will be warranted. paper-tearing. Basically speaking, a typical x-fine, fine, medium or broad nib has a rounded ball of tipping material at the end of the nib, which produces a correspondingly-sized line of ink that's the same no matter which direction the nib travels in. In contrast, an italic or calligraphy nib (experts will debate the differences between the two terms, but we don't need to here) is cut and shaped so that it's wide across, but relatively thin if viewed from the side. The photo below shows what I'm talking about, as the Pilot 78G nibs on the left and center have the typical ball of 'Iridium' or tipping material, while the nib on the right is cut across, to produce an italic-type of nib. Typically, such a italic or calligraphy nib has quite sharp edges, as compared to a conventional nib...hence my crack about 'paper-tearing' before. Unless care is taken, an edge can sometimes snag on the paper. That, and the fact that these nibs often have a slightly smaller 'sweet spot' than a conventional nib, can cause the writer to need to pay more attention to the mechanics of writing, and tends to slow down the process slightly. However, it's usually a fair trade, because of the 'beautiful writing' -- which is what calligraphy means -- that is produced. 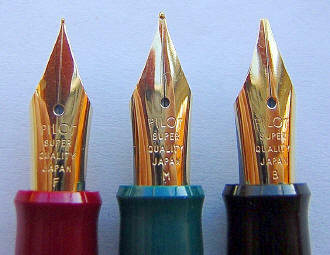 Enter my favorite nib...the stub!...and why I'm so happy to see it's addition to the Monteverde and Conklin line-up. In simple terms, a stub is an italic nib with smooth, rounded edges. Hence, you achieve the beautiful, 'shaded' writing of an italic/calligraphy nib, but with the speed, smoothness and comfort of a conventional nib. The paper-tearing fear is eliminated! It can still take a slight adjustment to find the somewhat smaller sweet-spot, compared to a conventional ball-nib, but a couple of minutes should take care of that learning curve forever. This nib modification allows for a thick line of ink in one direction (vertically, let's say), and a thinner one as the nib travels horizontally, as shown below. Consequently, one's 'hand' becomes more 'shaded', meaning a combination of thicker/thinner lines become apparent. My 'hand' is nothing to write home about, but if you enlarge the image above, take a look at the fourth line -- written with the stub nib -- and focus on the second word...'is'. If you look at the beginning of the 'i' in the word 'is', you'll see that it begins much thinner than the rest of the letter. Compare that to the 'i's in the three lines above it, written with conventional nibs. That's the 'shading' I'm talking about, and it becomes much more apparent with a full page of handwriting (and a better handwriter!). 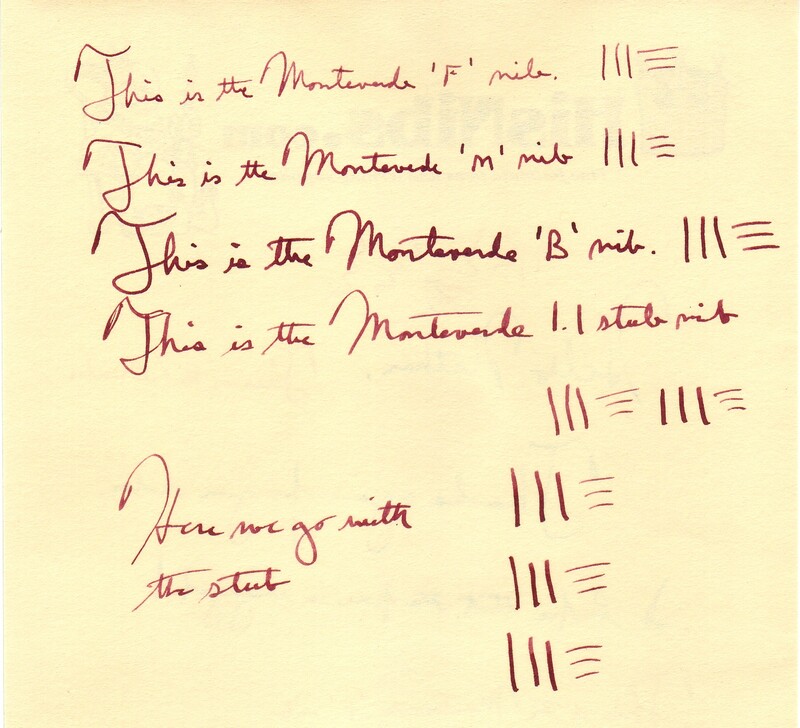 The Monteverde/Conklin stub nibs are 1.1 mm across, which is generally considered to be in the medium range (don't get me started on the lack of standardization of nib sizes -- one person's medium is another's fine! ). 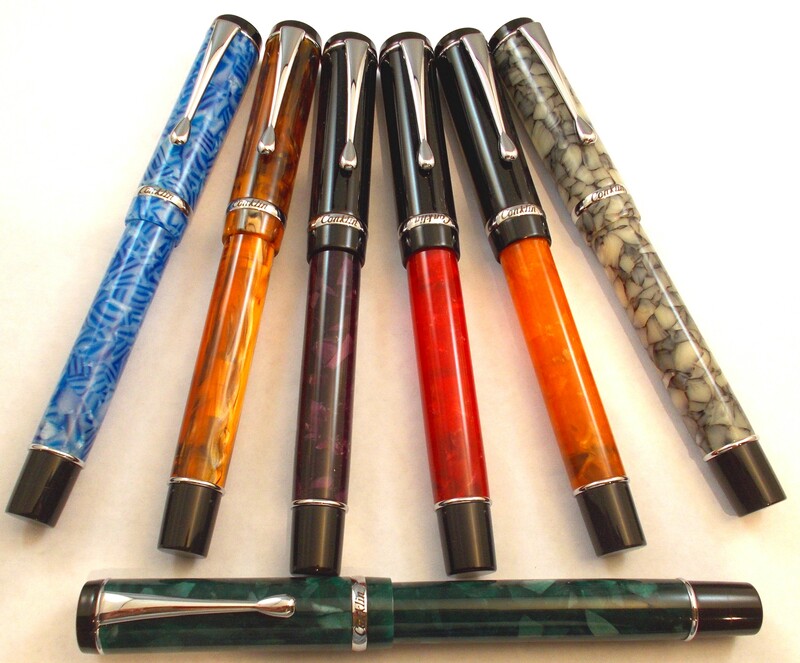 In the current Monteverde line, they're available for the Invincia, Color Fusion, Titanium, Prima and Regatta lines (I haven't had a chance to put up a page for the new Regatta or Invincia Deluxe carbon-fiber pens yet -- both shown in the video -- but they are available for ordering now). 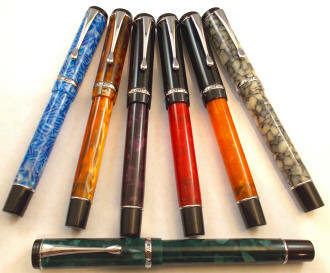 The nibs are available in 'silver' steel or 'black' steel coated in titanium. 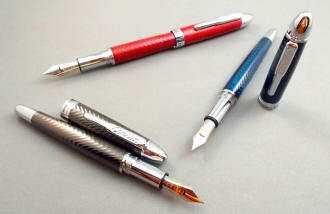 As for Conklin, the Conklin stub is available for all models except the Symetrik, which uses a smaller nib, and the limited edition Deco Crest. 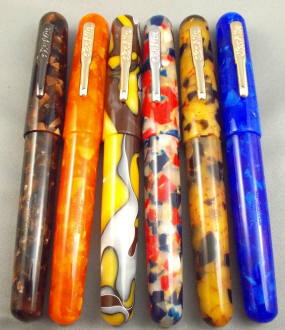 For either Monteverde or Conklin, the stub nib can be specified when ordering -- or if you'd like a one of the stub nibs for a Monteverde or Conklin that you already own, they're available for $24.00 each.